Carnation Auto Blog: Nissan Terrano Vs Ford Ecosport – Let the War Begin! Nissan Terrano Vs Ford Ecosport – Let the War Begin! Compact SUVs like Renault Duster and Ford Ecosport did an amazing business in the slow Indian auto market. Mini SUVs are surely in vogue and most automakers are trying to enter this segment for boosting sales and presence in the Indian market. Renault Duster started the movement however the sales of Duster went down after the launch of Ford’s most awaited car with an unbelievable price tag Ecosport. Ford Ecosport is a sporty car that looks good in the Indian roads. It received around 30000 bookings within one month of its launch breaking all existing records. Earlier this year, Honda launched its first diesel car Amaze, which also became much popular but Ecosport just made to the top with its price, mileage, specifications and style. The Indian auto market needed something to end the year with that much needed bang hence here’s Nissan’s much awaited mini SUV Terrano for you. Nissan Terrano looks like a Renault Duster with more features and flamboyance for sure. Terrano is a premium vehicle, which will compete against its cousin Duster and the most popular car of 2013, Ecosport. Nissan Terrano is so much similar to Renault Duster in the exteriors and makes no big first impression but it has great features and space in interiors compared to Duster that can be a game changer. Ford Ecosport looks great and the most important thing is its aggressive price tag. Ford Ecosport is available at Rs. 5.59 lakh, while the base variant of Terrano will cost you Rs. 9.58 lakh. India is a price sensitive country hence Ecosport surely wins the battle in appealing the mass while if you want to drive a premium SUV with great legroom in the rear seats, Terrano is a must buy. Nissan Terrano has a front wheel drive configuration just like the Duster. Two engines such as 1.6 litre petrol and 1.5 K9K diesel are available. 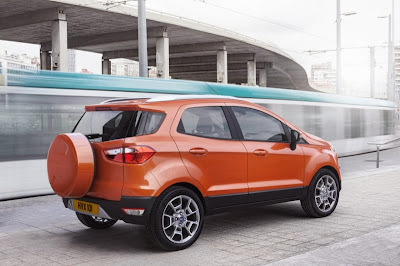 The petrol engine delivers a maximum power of 104 PS while the diesel engine has two output options of 85 PS and 110 PS while the base variant of Ford Ecosport produces 110 bhp. Nissan Terrano delivers a maximum mileage of 18.12 kmpl while Ecosport is able to deliver a maximum mileage of 20.32 kmpl. Ford Ecosport is a stylish car, which will mainly target the youth while Terrano is a sophisticated vehicle will some ultra-smart specifications especially designed for youth and successful professionals. To get all the details of Nissan Terrano, Click Here: Nissan Terrano Engine, Specifications, Mileage, Price etc.